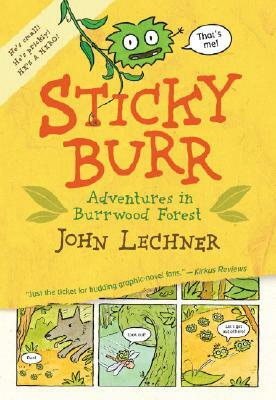 Meet Sticky Burr, his unshakable friends, and his prickly foes in a beguiling graphic storybook guaranteed to grab young readers. Welcome to Burrwood Forest, where a village of seed pods are busy having adventures! There are friends like Sticky Burr and Mossy Burr, who stick together, and bad seeds like Scurvy Burr, who irritates them every chance he gets. Watch out for wild dogs and maze trees, loyal insects, and escapes on the fly in a gently quirky graphic storybook that readers are sure to get stuck on. John Lechner is an artist, animator, multimedia designer, puppeteer, and author-illustrator of the picture book A FROGGY FABLE. He lives in Needham, Massachusetts.